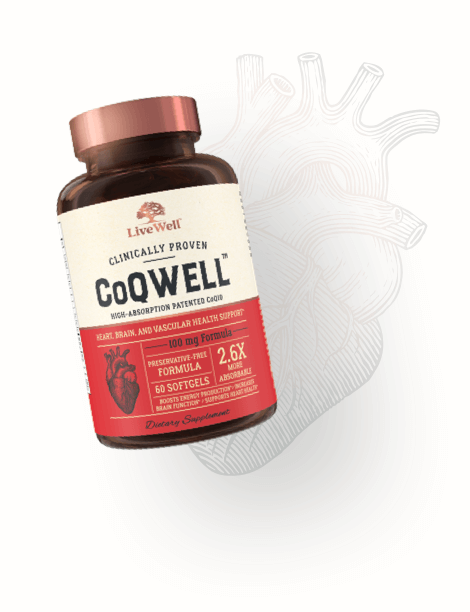 Livewell CoQWell™ offers a patented coenzyme Q10, containing a powerful combination of antioxidant and immune system-supporting properties that promote and maintain healthy levels of cholesterol, blood sugar, cellular energy, and heart and brain function, increasing your overall health and wellness. CoQWell’s clinically proven formula includes 100 mg daily serving of CoQsol®, replenishing the naturally occurring coenzyme in every cell of your body, to fight cellular deterioration and revitalize your health. CoQWell’s potent antioxidant properties, derived from a 100% all-natural yeast fermentation process, boosts your immune system defenses and never contains any artificial fillers, so you can live well. Coenzyme Q10 (CoQ10) is a powerful antioxidant that your body produces naturally and is an essential element for many daily functions, required by every single cell in the body. 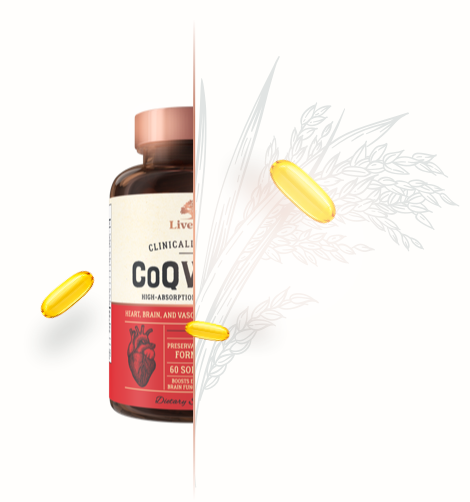 CoQ10 has strong potential for prevention and treatment of heart ailments, and aids function for maintaining cognitive health, a fast metabolism, strength of muscles, strong bones, youthful skin, and healthy tissue. CoQsol® is a patented, oil-based formulation of CoQ10, in the ubiquinone form, clinically proven to enhance absorption more than 2.6 times better than generic CoQ10 crystalline powder. vital to human health. This unique, synergistic blend of CoQ10 delivers powerful antioxidants like natural vitamin E, Pro-vitamin A from natural beta-carotene, and rice bran oil directly to the organs most vital to health.